£10 Gift Voucher to be used in store or online. Please select and click on, one of the vouchers from the panel on the right. Then simply enter the Recipients Name, Email Address and a short Message to your voucher before adding to the cart. Purchasing this product online will generate an email voucher which can either be used online or in the shop. £100 Gift Voucher to be used in store or online. £15 Gift Voucher to be used in store or online. £20 Gift Voucher to be used in store or online. £200 Gift Voucher to be used in store or online. £25 Gift Voucher to be used in store or online. 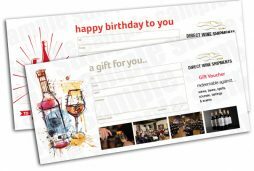 £30 Gift Voucher to be used in store or online. £50 Gift Voucher to be used in store or online. £500 Gift Voucher to be used in store or online.